Sometimes when conditions are just right, you find fleas in your house. It’s never just one, and only if you’re lucky does the problem go away on it’s own. It’s frustrating, but you have to understand a little bit about this pest and how to deal with it to successfully remove it from your home environment. House fleas are almost always associated with pets. Just treating your dog or cat the areas they hang out in the most, unfortunately, isn’t going to do the trick. And what do you do if you don’t even have pets? Fortunately, there is a way to get some relief and win the battle against these pesky, skin irritating rascals. You just have to arm yourself with a little knowledge and the right products. Read on to learn what you need to consider with these insects and steps to take for getting rid of fleas forever. First, let’s make sure you know what you’re dealing with. A typical house flea is usually the common cat or dog flea. While there are a numerous types, adult fleas all grow to about the same size (yes, they are clearly visible with the naked eye!). They can range in colors from a semi-transparent auburn-brown to darker brown or almost black when fully developed. We know them mostly from their trademark jumping abilities; they leap so quickly and cover such long distances in one super-springy bound that they look like they’re disappearing when you try to grab one. They’re just elusive as a fly! Many of us also know them for their bites, and therefor more annoying than ants or even spiders. It’s true that these blood-sucking bugs thrive on furry mammals like Fido, but many fleas will enjoy meals on humans too. Small, red dots or bumps can appear on our legs, arms, bellies and necks without us even knowing what happened. If you’ve spotted fleas in your house, you could have anything from just a temporary annoyance to a major infestation. Unfortunately, it’s rare that you would only end up with one or two. Once a flea gets inside your home, by the time you see it (or get bitten), you’re in trouble. Again the leading partner in crime when you have fleas living indoors are pets. It’s not all their fault though, because fleas can stick to us humans just as easily. Just walking outside, a tiny flea can jump on your clothing or bare skin unbeknownst to you. And all you have to do is bring one inside who lays some eggs in your carpet, clothing or sofa (gross, right?) and the repeating life-cycle begins. There are ways to stop this process entirely if you act early, but more on that later. If you have pets that come in and out of the house though, and you find fleas, it’s a safe bet they are responsible for bringing them in. Believe it or not, even if you’ve treated your pets for fleas with skin gels or collars, fleas can still hitch a ride right through the door. If the type you have in your area “like” human blood, then it’s just a matter of time before you notice a bite (especially when your pet is unappetizing because you treated them). Fleas can also survive for weeks and months without a meal, so it’s not uncommon for them to find soft, dark places in your home to live and reproduce while they wait for a viable meal host to come along. Contrary to what you’ll hear at pet stores or even from some exterminators, fleas can live on humans. A human flea bite is usually not felt, but can itch for a couple days and become unsightly especially if you scratch it a lot. It will start out as a bright red dot (size of a dull pencil head or larger) and turn darker as it fades over time (usually a week or more). In most cases, you won’t see the fleas on your skin unless you’re looking for them. The best thing to do is quickly, but carefully, capture it by squeezing it between your thumb and index finger. When you’re sure you have it, run your fingers under water until you see the flea go down the drain. Do not attempt to crush or smoosh the flea on your skin or any other surface with your finger pads. Their soft skeletal structure won’t allow them to be squished easily. You need two rigid enough surfaces. If you don’t catch a flea on you, it’s possible it can bite, have a meal and jump off. It will be back for more, you can count on that. Once you find a flea on humans in your house or a bite, you simply need to wash and/or vacuum all the areas where the flea was encountered. This means a thorough cleaning of all furniture, cushions, carpets, bed sheets and other linens at least once. Be sure to throw away the vacuum bag or completely empty the bagless container far away outside in the trash can. It is possible for fleas to live in human hair. In most cases though, it’s your hair that gets washed regularly, but not the blanket on the sofa or the rug by your bed. Fleas prefer deep, undisturbed places they can hide and lay eggs and begin their life cycle, so human hair is not their first choice. Follow these basic 3 steps to get rid of your flea problem in your home or apartment. There are some primary principles that work for just about everyone and some further tips to try depending on your situation. You’ve probably heard it before, but it’s important to take an aggressive approach to ridding this bothersome pest. This means: 1) removal, 2) cleaning, 3) treatment, and 4) repeating as necessary. 1. First, get rid of all adult fleas you see on you, your pets and areas of your home. You don’t want these guys biting any more, and you don’t want them laying any more eggs to keep future generations going strong. Follow the next step to get this done thoroughly. 2. Second, start cleaning house. This means, a thorough vacuuming of all rugs, large carpets and soft drapery and furniture surfaces. This may take 2-3 passes over a couple days, but take comfort in knowing your sucking up a big percentage of the fleas living in your home. You’ll need to wash all pet linens, beds, small rugs and clothing that are anywhere near where you saw or suspect fleas. Use the hottest water possible. You’re not only getting rid of fleas you can’t see, but their eggs, larvae, and pupa will be washed away too. 3. Third, treat the areas you just cleaned with a good flea control product. In the past, it was hard to think of loading your house with chemicals, but today they have some great options that work well at killing and keeping fleas from coming back in your house. And best of all, the products are perfectly safe for the canine, feline and human inhabitants of your house. Flea foggers are talked about among homeowners, but in most cases you don’t need them. They are literally overkill and require a lot of work as you need to properly cover food and dishes before setting off. All you need is a good spray that you can easily and safely apply by hand to reach the areas that matter for adequate flea control. 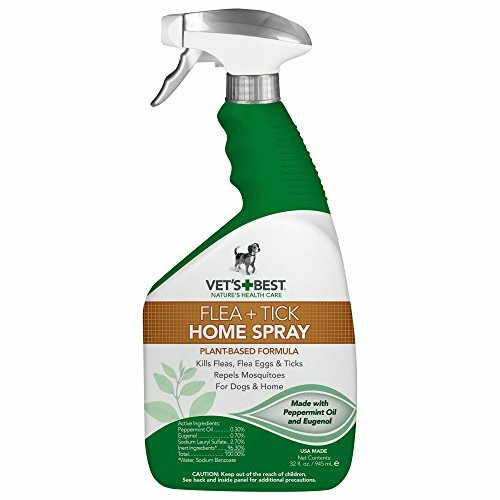 One such product by Vet’s Best is their “Flea + Tick Home Spray”. Believe it or not, it’s a certified natural essential oil-based product that actually works – there are literally thousand of Amazon reviewers who attest to it! One bottle should cover a typical home’s rugs, furniture, pet bedding and any area that can harbor fleas. That said, if you have fleas that seem to come out of nowhere in the middle of your carpeted floor, it would be good to spray your carpeting. Just pick up an extra bottle or two depending on the size of your home. They do sell them in a 2-pack. What’s great about this spray is it contains an all natural insect growth regulator. This is not just crucial, but necessary to solving your problem completely. It basically means its ingredients will take care of the early life cycle forms of the house flea (egg, larvae, pupa) as well as the adults. While it may seem expensive (it’s still well under $20), it only seems that way compared to other sprays that can cost much less. Unfortunately the other sprays, found at many stores only affect the adult fleas. Brushing in Vet’s Best flea treatment after misting coat surface. The eggs they’ve left behind (that’s a guarantee) will hatch if they haven’t already, unaffected by the less effective sprays. Invest in the better product, like this one and you’ll get the results you want. Be sure to use the spray liberally, lifting up rugs and couch cushions and pillows. After you spray, be sure to circulate the air in your home with open windows if possible and allow to dry. While the essential oils are non-toxic, they can be a little strong if you’re spraying a lot. A quality product like this will also last for at least six months. It should also go without saying that if you have animals indoors, you must treat them to to truly get rid of the fleas in the house. Ask your vet about the appropriate product for your furry friends. If you happen to still find evidence of fleas in your house, don’t hesitate to repeat your cleaning process. Usually the first pass of a bottle like Vet’s Best will take care of the problem. There’s no indication on how long the treatment lasts, but you can reapply as needed, and it should be more than enough to get you through the worst of the flea season. Again, check out the reviews on Amazon and you’ll find that it works wonders for most people. They make a product for dogs and one just for cats. I’ve tried natural remedies for fleas, and they didn’t work on ours. Aromas they’re supposed to hate like lemon, mint and lavender didn’t sway them at all. Diatomaceous Earth (DE) powder also didn’t “hurt” them as they just kept walking through it undisturbed. Go with the spray, it works right away and lasts!